Yardley Labs Volare da Sola (FC AFC Way-Da-Go Call of the Wild x Yardley Labs Ms T-Maxx***) is now almost 6 years old and has matured into a very sweet adult who continues to show her wild side when playing with her younger sister, Blue. Sola's birth was the result of lots of planning combined with an inordinate amount of luck - some good and some bad. 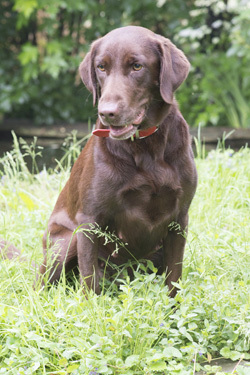 I wanted a chocolate female out of my girl Misty to replace my wonderful dog Sadie as she became too old to breed. I selected Drake to be the sire since he was, at that time, the top titled chocolate field trial dog in the country, was EIC clear, and was uncle to a then young dog named FC-AFC-CFC-CAFC Upon the Wings of an Answered Prayer NDC, whom I had followed closely as a 1-2 year old and who became the all-time high point Derby level field trial dog in history. The timing for the litter wasn't perfect, since the breeding would need to be done by artificial insemination given that the stud was 3,000 miles away at the time, but nature controls timing, not the breeder. Even with that, things didn't go according to plan and the result was a single puppy litter - thus leading to Sola's name, "Volare da Sola" which means "she flies alone" in Italian. With a single puppy. the odds of a chocolate female were only one in four, so I was happily surprised that I got the puppy I wanted, a chocolate female, even if she was the most expensive dog I have ever owned when you add up all all the bills associated with her birth! Sadly, the timing problems weren't over. When Sola was three months old, I had another litter born and when that litter was two days old I was admitted to the hospital for emergency surgery that represented just the first of four surgeries over a period of four months. My kids took care of the litter, but all of my other dogs, including young Sola, had to be sent away until I was healthy enough to care for them again. Sola missed out on a lot of the socialization that is so important for a young, athletic pup and remains the only one of my dogs that has never been trained as a retriever. She is a little less disciplined than my other dogs, a little more excitable, and is always a little obsessive in making sure that all the other dogs are exactly where they are supposed to be. But her breeding shows in every line of her body, in the fact that she runs like a deer, and in the sweetness that she has had since birth. That, along with her obsessiveness, has made Sola a great mom. Her pups are always lined up, counted, fed, washed and ready for inspection. Her first litters were sired by Rebel Ridge Willie Wonka Do It MH QAA, a wonderful dog that I have known since he was a one year old and running Derby trials against Sola's mom, Misty. Now Willie is no longer able to breed because of his age and Sola's next litter expected from her breeding to Ironlines Amphibious Assault QAA (FC Fargo II x FC AFC World Famous Tellipath). 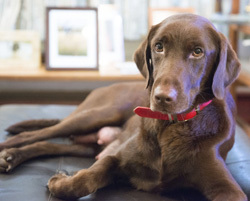 Of 14 dogs in Sola's three generation pedigree, 12 are hunt titled or qualifieid all age, including eight field champions and two national champions. A link to her full pedigree is provided above.